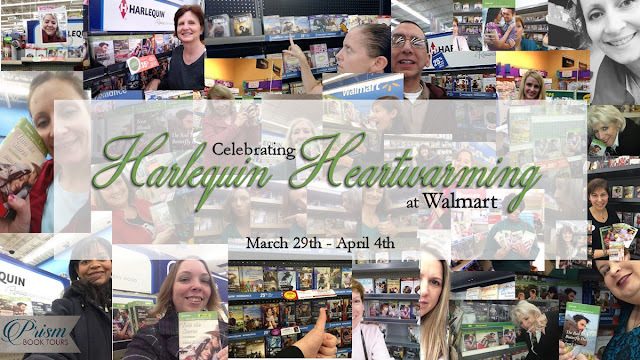 We're thrilled about Harlequin Heartwarming books being available in select local US Walmarts! Find out if they're at a Walmart by you here. "I am so excited that Heartwarming books are now available at Walmart, so some lucky girl can go visit her aunt and possibly stumble across one of MY books and fall in love!" "I was thrilled to find a home in the Heartwarming line. Writing these sweet romances that emphasizes the emotional adventure of falling in love feels almost like a calling and now, that dream I thought I'd achieved has now grown. The Heartwarming line is now available in select Walmarts!" "I’m thrilled that I’ll get to add more Heartwarming books to my bookshelves now that Heartwarming paperbacks will be available at Wal-Mart. A Heartwarming story will be within reach no matter if I pick up my Kindle or a paperback… there’s nothing better than that." "Real books printed on paper that you can hold in your hand and smell and flip through the pages." "I believe in 'happily ever after' and through Heartwarming and Walmart, we’re able to bring more of these moving stories to the people who have been searching for something touching and magical." "It's not always easy to find a romance that's clean and wholesome with a rich, compelling plot and multi-faceted characters to root for all the way to a happy ending. . . . You can trust this brand of our books in the line each month to provide a great reading experience. Pick up a copy (or more) today. And enjoy!" "Buying books for my ereader may be easier than driving forty-five minutes to the nearest bookstore and having digital reads may be a handy way to travel without carrying six books with me (and hide just how big my to-be-read pile is from my husband), but it’ll never completely replace a book in my hand. And I wouldn’t have it any other way." "I love, love, love finding a new book on the shelf, taking it in my hand, feeling the smooth cover and turning the book over to read the blurb. . . . Now, Harlequin Heartwarmings will be in stores as well. Wow, it feels a little bit like Christmas." ". . . if I have the option of spending time in a real brick-n-mortar bookstore and buying a tangible book that I can anticipate experiencing with all my senses, I go straight to print books." "Walmart has signed on to put one of my favorite lines, Harlequin Heartwarming, on the shelves of over 400 stores! That’s four more Harlequin books a month. Books filled with emotion and strength. Books that embody the love and hope that the people in our world so desperately seek."